Wonder Woman has exploded across the silver screen, breaking all records: the first major female superhero film; the first major superhero film directed by a woman; the second $100M-budget film with a female director; and the biggest opening weekend ever for a woman-directed film. 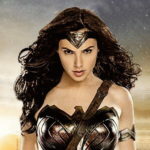 Starring Gal Gadot as Diana Prince and Chris Pine as Steve Trevor, Wonder Woman is a box-office blockbuster, a fantastic film, and a milestone for feminists. In this episode of Polygamer, I reunite with Sabriel Mastin, with whom I previously reviewed Star Trek Beyond. In the first, spoiler-free half of the podcast, we share our history with the DC universe and the ways in which this film diverges from DC’s theatrical track record; Wonder Woman‘s casting and the interplay between the two heroes; the temporal anomaly of the World War I setting and how it compares to Captain America’s WWII; visual decisions such as the color saturation and battle choreography; and the practicality of Wonder Woman’s armor. The second half of the podcast, starting at 36:23, is reserved for those who have seen Wonder Woman — tune in to hear plot details, big reveals, and more!